This breakfast starts the day right on two accounts: (1) you know it's healthy, (2) it's delicious. Then #2 makes you go back and blink your eyes at #1, and then it gets even better. It qualifies as 3 reasons, really. But don't just take my word for it. Unlike the more common breakfast cereals (those ubiquitous grain puffs and their endless flavor variations), muesli holds up really well to being soaked in cold milk. The flavor is also rescued from single dimensionality by the different tastes and textures of its bits. Basic muesli ingredients: Grains, fruits, nuts. The original birchermüesli recipe contained more fruit than grain, but that's what's great about making your own - you can decide what to put in and how much of each. A box of müesli would have been the last breakfast item I'd have reached for at the grocery until last year. For one, it's always packaged as health food, and perhaps my chocolate-loving brain dismisses anything like that as boring. And for another, it's spelled funny, occasionally with that umlaut. Whether or not the avoidance was from fear of being asked what I ate and not being able to pronounce it, I don't really know. Thankfully, I don't have to introspect because I've long discovered that the Merriam-Webster site has a pronunciation functionality; and I've discovered that muesli isn't too bad after all. It was my husband who bought that first box, a Simply Cereal Apple and Cranberry. He did the food shop the week after I gave birth to our youngest, and picked up 'quick food'. He went, "You like oats, apples and cranberry, so I thought you might like this." I looked at the box and in my head I went, "Oh, THAT. Yuck." But he poured me a bowl of it, and he was holding up really well to all the household chaos of that crazy time, so I decided to be nice about it. And I'm glad I did. When the box was finished, I started making single servings from scratch because I always wanted to put extra stuff in it. After a while, I realized the idiocy of pulling out bags of oats, chia, walnuts, raisins, brans and coconut sugar every time only to get a few tablespoons of each, so I finally made a whole jar of the stuff. I found a recipe on AllRecipes.com, and with a few additions from my lactation cookie ingredients, some substitutions, and addressing my discomfort about eating raw oats, I've come up with my own recipe. 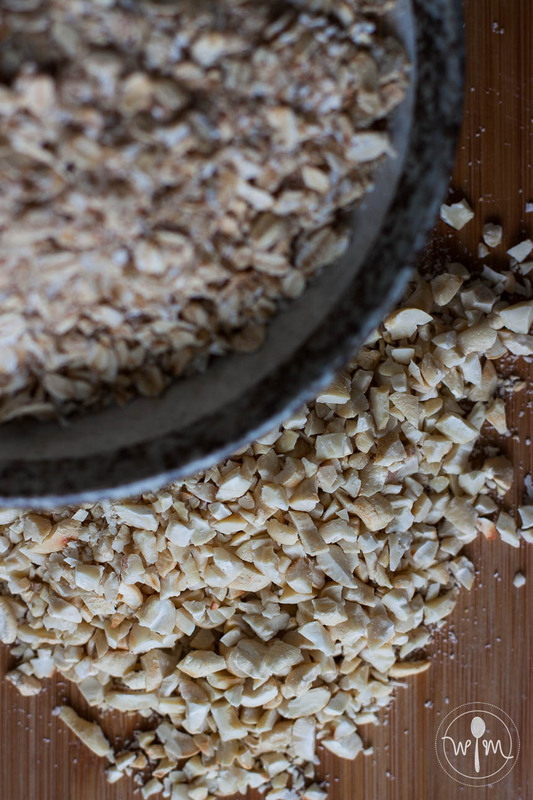 The extra step of toasting the nuts, oats, wheat germ, and dessicated coconut deepens their flavors. You can totally skip it though and still have good muesli, but if you have an extra 15 minutes on a Sunday afternoon, I highly recommend giving it the time. Toasting the nuts also help to keep them from going rancid too quickly. Toasted oats, bran and coconut flakes on the left, toasted cashews on the right. This could totally be my imagination, but they also chop up nicer and easier when toasted..
all the ingredients that are not going to be toasted, such as any pre-toasted bran, raisins, flax seed meal,chia seeds and coconut sugar. in a big bowl. Transfer to a dry, airtight container and use within two months. You can enjoy your muesli as you would normal cereal, with a bowl of milk or yogurt - or both! There are other possibilities as well, you can totally get creative: you can add this to cookie dough to make energy balls, bake with some honey to make granola.. In a large mixing bowl, mix the ingredients that you are not going to toast: oat bran, wheat bran, raisins, flaxseed meal, chia seeds and coconut sugar. In saucepan over medium heat, toast the nuts for about 2 minutes, or until they smell fragrant and start to brown. Immediately take them out of the pan and onto the chopping board to prevent further cooking. 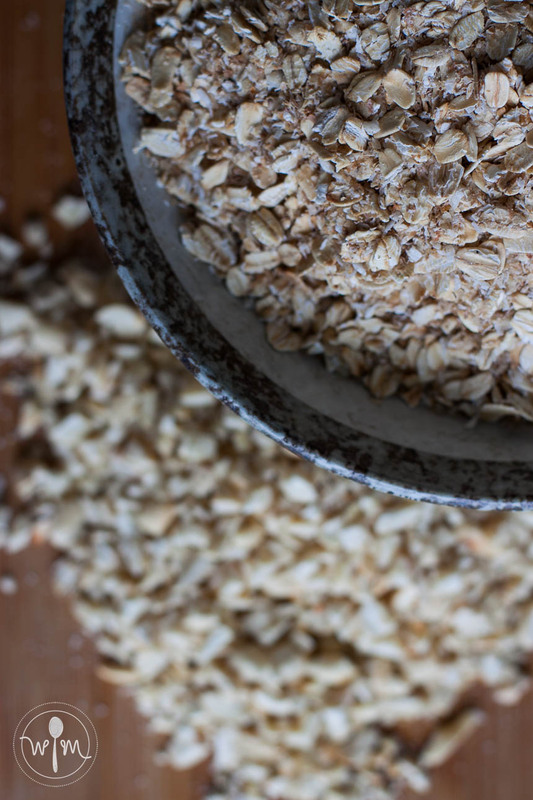 Without turning the heat off, add all the rolled oats and toast for about 2-3 minutes until they start to smell "nutty". Turn the heat to low and immediately add the wheat germ and dessicated coconut. These two burn very easily so remove from heat as soon as they start to smell fragrant, about 30 seconds. Add the toasted mixture to your mixing bowl containing your raw ingredients. Chop the nuts and add to the bowl. Toss to combine. Transfer the mix to an airtight jar and use within two months. Nuts burn easily, so don't take your eyes off them and make sure to toss them around. The ambient heat in the pan toasts your ingredients a bit more, so immediately transfer the mixture to a mixing bowl (Step 5) to prevent them burning. Note that you're working with 2 cups of oats during toasting, so use a sufficiently sized saucepan that will let you toss them around easily. My favorite thing to do with it is still overnight oats, similar to the original birchermüesli or Swiss oatmeal. I've included a printable recipe at the bottom. Mix the müesli, yogurt and milk in a bowl or jar. Cover and refrigerate overnight. Top with fresh fruits before serving. You can adjust the yogurt and milk proportions to your preferred consistency. The original birchermüesli calls for grated apples and indicates to soak the oats and fruit in a tablespoon each of lemon juice and sweetened condensed milk. If you make this and like it, please share with me using the hashtag #pinayworkingmom!